A few quick thoughts on the 2017 W.T. 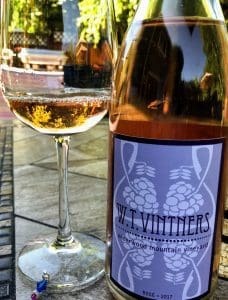 Vintners Rosé. W.T. Vintners was founded in 2008 by Seattle sommelier Jeff Lindsay-Thorsen and his wife Courtney with George and Casey White. An advance sommelier working on his Master Sommelier certification, Lindsay-Thorsen is currently the wine director at Michael Mina and Rajat Parr’s RN74 in Seattle. Prior to this, he built highly acclaimed wine programs at Cascadia Restaurant (now closed), Wild Ginger Bellevue and Holly Smith’s Cafe Juanita. 100% Pinot noir with around 55 cases produced, the rosé is sourced from the Underwood Mountain Vineyard. Planted on the volcanic and clay loam “Underwood Series” soils of an extinct volcano, the vineyard is part of the Columbia Gorge AVA. First established as an AVA in 2004, the Columbia Gorge is unique in being an Eastern Washington AVA that is technically outside the large Columbia Valley AVA that encompasses most of Washington’s wine regions. Extending into Oregon, the AVA includes the foothills of the Cascades that is bisected by the Columbia River with cool fierce winds following the river and creating a wind tunnel effect. This creates cool climate terroir that can be dry farmed with annual rains ranging from 18 to 30 inches a year. Medium-plus intensity nose. Very floral with orange blossoms and rose petals. Underneath the flowers is some bright cherry. Really gorgeous orange blossom notes in this rosé. On the palate this is a very weighty rosé, almost Tavel-like, which is pretty remarkable for a Pinot rosé made in what I presume was the short-maceration method. Medium-plus acidity, though, gives plenty of freshness and balance to the fruit and lets the lovely floral notes persist through the moderate-length finish. At around $20, this is an exceptionally well-made and character-driven rosé that was a joy to drink. The weight and texture of the rosé opens it up to more robust food pairing possibilities (like some of the one’s Jennifer Simonetti-Bryan mentions in her book Rosé Wine) but it is quite delicious on its own. Tagged Cafe Juanita, Cascadia Restaurant, Columbia Gorge, Columbia Valley AVA, Holly Smith, Jeff Lindsay-Thorsen, Jennifer Simonetti-Bryan, Michael Mina, Pinot noir, Rajat Parr, RN74, Rosé Wine, Underwood Mountain, Wild Ginger, WT Vintners.